Wooden handmade from professional craftsman with unique and creative design. It is very perfect and nice to use as indoor and ooutdoor decoration or use for personal collection. This handmade product is polished in brown color or old wood color to get the artistic value. Wooden handmade product with Knight form carved uniquely and artistic. You can put it on your office, living room decoration, party decoration, school, and so on. 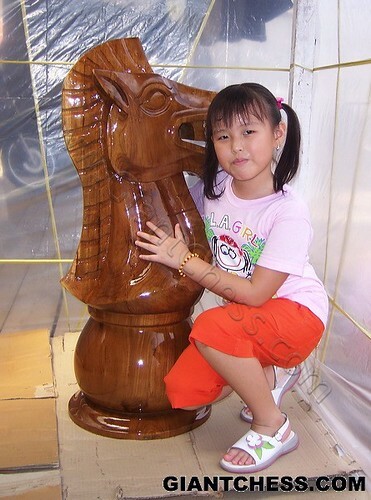 Giant knight chess has made from best quality of Teak wood. It is durable product, so you can put it at you patio area or backyard area. It's perfect also for use as gift or present for friends and partner. Beside the Knight, we also have another chess piece which carved in giant size, such as the King, the Queen, the Rook, the Bishop, and the Pawn. Choose the chess piece that suit with your house decor style. Or if you have large patio and garden, you can consider to decorate it with our wooden giant chess set.